You came in second in the "Sexiest Tutorial Voice - Male" category as judged by my wife. Paolo of Reality fame came in first. Sorry. While I was out, I've read a message posted by bigh that has been removed by the moderator. For me there was no problem to leave it visible. @bigh: there are 23 INFINITO tutorial movies on my YT channel. You've always been upset about these tutorials and I honestly don't understand how many more movies I should have done to satisfy you. I said I would have done, time allowing, another set of movies to show how I did the Avatar-like floating mountain. I said also that LAMH would have been probably ready in the beginning of September. When I can't comply with planned work, it's not because "I don't care of customers" as you said; it's just because things often get more complicated than expected, and need more time and care than planned in the beginning. In the future I'll be very careful with "promising" and scheduling releases, so that nobody will get upset. So back to us bigh, if you feel that the plugin is useless, please ask a refund to DAZ and if there are issues with that, contact me to my email ( info at alessandromastronardi.com ) and I'll refund it myself. Ok? I want to apologize to you and every one else for my rant . Well sent you a pm . Takes a big man to apologize, so my hat's off to you!!! Know how frustrating it can get, all the new stuff in DAZ and no real Doc to help. Hi bigh, just checking out that didn't receive any PM, so in case you did you know something went wrong. Is there any way to drag the end of the hair towards a certain area> Like a hair "Magnet" if you will? Are hairs affected by DForm? My intention was to CREATE hair style presets and market them not only for those WITH the product but to make sets with morphs for those who didn't have the product. I'd say that DForm's would work if you export hair as geometry (i.e. obj) but not on RenderMan curves. DForms and a quick trip into ZBrush will add needed morphs. Though not the nice ones that can be done with individual pieces, not that I can see so far. Time will tell, we will figure all that out when this fabulous program is released. FYI, this combined with one of the atmospheric cameras (the one that can do neat displacement maps) could help in hair creation for traditional transmapped hair. You tired? I think thats the first time I have no idea what you're talking about! This is the camera I mean. Now, look at this section in the User Guide. You know how "normal" DAZ/Poser hair has bump, displacement, etc? Okay. Create a primitive plane, with hair, let's say, sticking upward. You do some styling to it, comb some curves, whatevs. 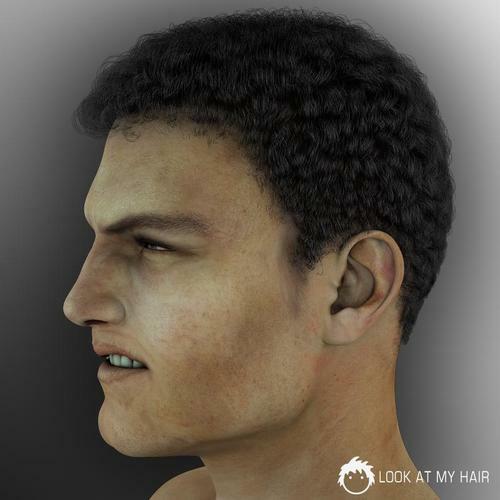 Are you saying combine traditional hair making methods at the core of a hair product and then use LAMH around the edges so that the core has good body and thickness with transmaps and such and then use LAMH around the edges and along the surface for a realistic but lower-poly solution to creating hair models? No no no no. Well there is prolly that too, but I'm talking about texture creation. I ran into a frustrating problem earlier, as I was trying to find good substitute for Mitsu Hair (for Genesis) textures, which needed to be natural, rather than anime. I found none. My own hair resources weren't fine-tuned for that sort of hair, so the end result was rather clunky. 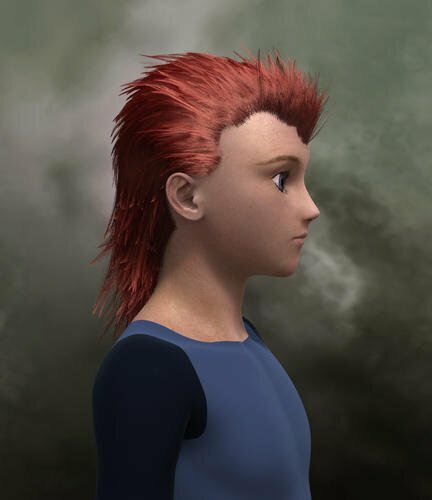 But, if I were to render a bunch of hair, styled like I wish, for texture... from diffuse, to bump, displacement, specular, maybe even opacity... and then apply the resulting textures to that frustrating Mitsu Hair. I just started laughing when I read this. The question is? Who will be more demanding/finicky, your real life customers or your cyber ones? 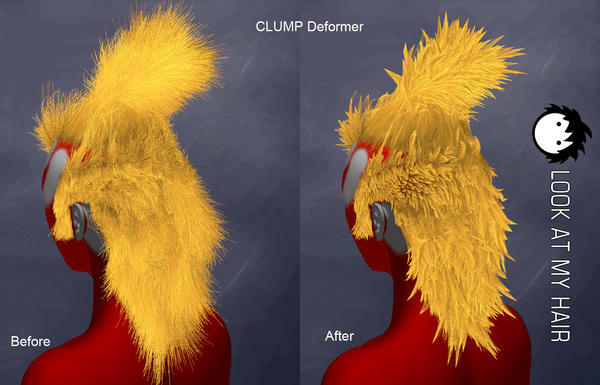 Here's a look at the Clump deformer this is just a dial no brushing involved. That's awesome. Is there a way to mask of areas so the clunping tool only affects certain areas? Kane yes there is because it uses layers so you could create a shavegroup(layer) for what you want clumped and another shavegroup you dont want clumps to effect ect. Nice...soooooooooooooooo looking forward to this. I played around a bit more changed the style a bit. One thing I like when you save the project it reload the genesis shape and pose plus all the hair settings. Here's another plus I just tried pw_Toons shader on the hair and it worked well. 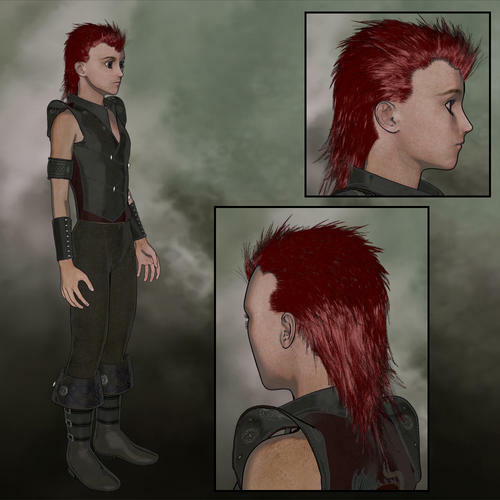 Beautiful renders MS, that hair styling is cool. Thanks a lot for sharing that. If you mean the colors of the inner ear? I think those are in texture itself, nothing to do with the hair. Looks like a few stray hairs to me if you mean the edges. That's looks real to me. EDIT: Oh yea I forgot this part, Are you done yet? I really want this Plug-in.